I must confess that food is a weakness of mine. Although it is not exactly an obsession nor necessarily an addiction, it ranks high up there as one of my favorite things to do. I do not use it to boost my mood (I don't have to; it automatically does it on its own), nor do I recur to food in times of trouble (not that there is anything wrong with that though). I simply enjoy food for food's sake. I am aware and admit that I am no gourmet or food critic nor are my taste buds particularly refined. But I know good food when I taste it. I find that gourmets are too interested in the aesthetics of food, which is in my mind not too important when we are dealing with food. The problem is that refined food may look great, like a piece of art, but it is usually in very little portions or samples, not enough to fill me up. I prefer mouthfuls and would easily sacrifice looks for quality in this respect. Of course, food should not look or smell disgusting since that is usually a turn-off for gourmets and non-gourmets alike, but of course there can always be exceptions. But again food is something that gives me pleasure. It is beyond the realms of duty or necessity; I do not define it as something one has to do nor as a bodily need, and it is definitely not a nuisance. I am glad that we are not plants because I do not imagine sunlight being very tasty. Food gives me satisfaction and fills me up both physically and spiritually. It is a religious ritual minus the prayer. I do not generally pray before meals. Part of it may be a lack of custom or habit, but the other part is my suspicion that outward rituals may end up being either empty or of a hypocritical nature. Plus, they take away precious eating time. Nonetheless, whenever I partake of meals, I am respectful of food. I avoid conversation and fully focus on the meal ahead. This is one of the reasons why dates involving restaurants have not been particularly successful with me. It may seem, at least temporarily, that the partner has been delegated to a second place in comparison. I remain without further comment on that issue. In fact, I actually prefer to have food in known company, my family mainly, or alone since then I can indulge without any constraints, impediments or interruptions. Food gatherings are not my cup of tea, and I generally engage in conversations before and after my meals. I may sound like a glutton here; well so be it. There is an evident drawback of my guilty pleasure, namely that it contains calories and fats. At least, all the tasty meals do. As a result, I have gained a number of kilos over the years, especially ever since I met my wife (more on this or rather her later). The idea of going on a diet to me is more horrific than going jogging, though I have now taken steps to remedy my problem by exercising, that is swimming laps, on a (quasi) regular basis. Well, at least I have been doing so over the past weeks. 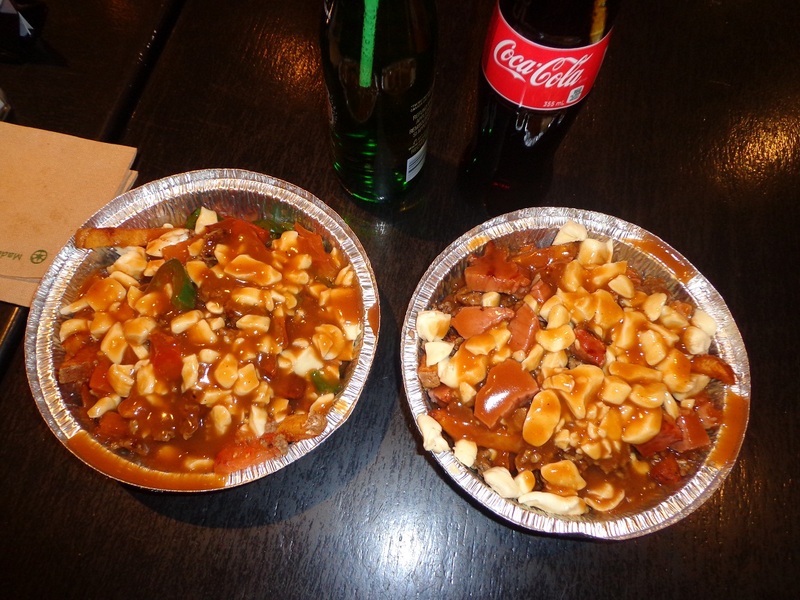 And nothing better than a hearty meal or delicious junk food after a good work-out to keep the balance of life intact. I am fortunate in three ways. First off, my wife is an exquisite cook. She may not be schooled or certified in any gastronomical way, nor was she always that good at cooking to be honest. But she has a certain knack for it, which amazes me; she manages to pick up and learn recipes in a jiffy. For example, we would have a meal in a restaurant, and she would repeat the same dish at home, only improved and better! I have even subscribed to the Food Network in HD since she often gets new ideas from those shows, and I am the one who benefits from it with its delicious outcome. However, I want to make clear that I do not in any way delegate women to the kitchen. In fact, I like cooking myself. I have tried a few dishes that I believe I do well (enough), and it is my (at least attempt of) cooking that won over the heart of my wife. But the joys of preparing a meal and of consuming it are two different realms, and for my purposes here I am concentrating only on the second one. Which brings me to my second fortunate reason. We live in an area that is filled with many food options. 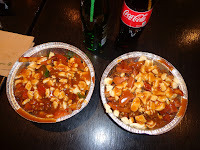 In fact, I do not have preferred ethnic food; I love Chinese, Japanese, Korean, Italian, German, Indian, Persian and Canadian (oui oui la belle poutine, see photo) food all in equal measure. And we have our preferred restaurants that we frequent for each nationality. I must admit that when it comes to food, I am rather "conservative." I would go to restaurants that I like at the expense of not trying new places. At the same time, I would hesitate to try new dishes but more often stick to those I know since they are guaranteed to be good and I like them already. The reason for this is I do not like disappointment, especially since I am excited and hungry for a meal and do not want it to become an underwhelming experience. It would ruin my day or perhaps the whole week! My third reason why I feel fortunate is the most important one. I can afford food, something that is not the case with many around the world. This is a sad fact and makes me more conscious of wasting food or rather trying not to do so. Unfortunately, however, I do waste food on occasion, and at least, to my credit, I feel guilty about it. I am most grateful that these pleasures are granted to me, and I do like to share food and break bread with others. Yet I still prefer a monkish silence over a lively conversation during meals. And yes, although I do not engage in formal prayer, I do thank God for what has been given to me. My only caveat would be to replace the phrase of “give us our daily bread” with “our daily food.” Man (and woman! ), as they say, cannot live off bread alone. And perhaps I would add the occasional wine to round it off. Indeed, two of my favorite religious icons are not averse to the pleasures of food and drink. The Buddha although a vegetarian would not turn down any food offered, even if it included meat, which went against his general principles. While Jesus claimed that whenever people get together to partake of a meal, he will be there, and he is definitely not averse to a glass of wine. It is indeed some serious consolation for me that when I am enjoying my meal, the son of man (and woman!) is also (eating?) right beside me. Bon appétit, and of course it is the savvy French that have such an adequate expression for the enjoyment of food!